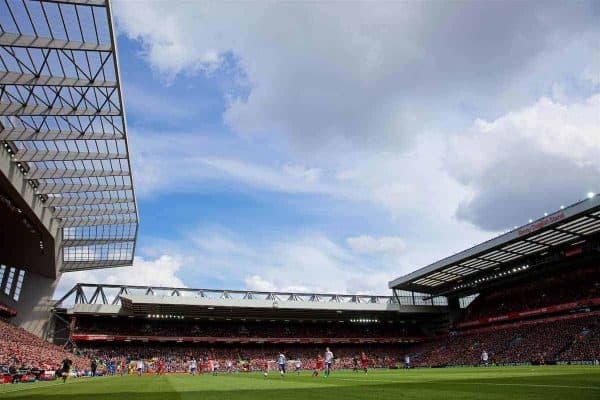 Anfield is the home to Liverpool Football Club, and is one of the most famous stadiums in the world. The ground itself consists of four stands; The Kop, Centenary Stand, Anfield Road End and Main Stand. The Spion Kop was a mighty terrace behind one of the goals at Anfield. It was built in 1906, as a reward to the fans after Liverpool had clinched their second league championship. It was an enormous structure, capable of holding as many as 25,000 supporters. It had 100 steps and towered above the Walton Breck Road behind the ground. The name came from a small hill in South Africa known as Spion Kop where in January 1900, during the Boer war, a battle left hundreds dead. Many of the soldiers killed came from Lancashire regiments with a strong contingent from Liverpool. The Liverpool Echo was the first to suggest calling it the Kop. In 1928 the Kop was extended and a roof added, this took the capacity to well over 27,000 and the new steel roof added to the noise factor. The noise generated and the swaying of the thousands on match day made for a great sight and was famous world wide. Spontaneous singing became a trademark of the Kop and the emergence of the Beatles in the 70s added to the atmosphere as the Kopites sang their favourite tunes and chanted the players names. On April 30th 1994, following the Hillsborough tragedy of 1989, the Taylor report ordered that every terrace in England must be demolished. So in May 1994 Liverpool Football Club played in front of the Kop for a final time. Unfortunately the Reds lost 1-0 on the day with Jeremy Goss of Norwich spoiling the party. 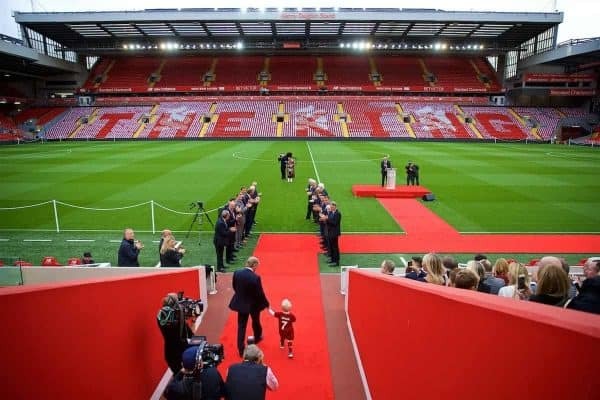 The occasion was still a memorable one and players from the past such as Dalglish, Keegan and Aldridge joined Bill Shankly and Bob Paisley’s wife’s on the pitch. The Kop was once the biggest single tier structure in Britain, with a capacity of almost 13,000. The Sir Kenny Dalglish Stand, as its name suggests, is in honour of the legendary former player and manager. The stand was re-built to commemorate Liverpool Football Club’s 100-year centenary, in 1992, becoming known as the Centenary Stand until 2017. It was previously known as the Kemlyn Road Stand. It has two tiers and can accommodate for almost 12,000 supporters. It hosts executive boxes and the banquet lounge, as well as PA box, TV set and police operations room. This stand is opposite to the Kop and was remodelled in the 90s. It has two tiers, with the top tier only small. Over the years it has hosted the away supporters at the ground and presently still does. LFC have outline planning permission to redevelop the Anfield Road End, adding another 4,500 seats. Newly built and opened in September 2016, the Main Stand was the oldest surviving structure at Anfield prior to it’s redevelopment. 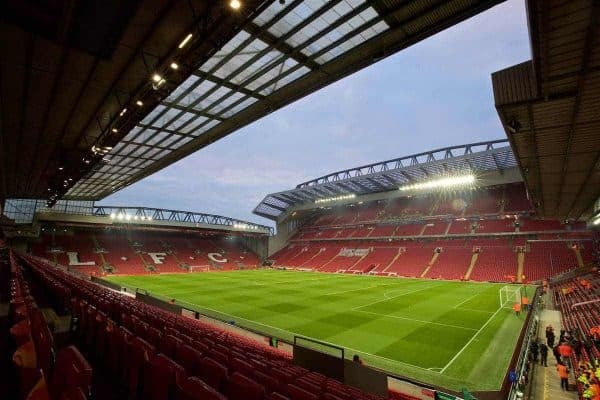 The Reds added 8,500 seats to a new three-tier stand at a cost of approximately £110 million, increasing Anfield’s capacity to 54,074.